Ideal setting for a relaxing holiday. Careful furnishings offer a welcoming environment. Beautiful villa surrounded by nature for a relaxing holiday. Custom services. The price includes the consumption of water, electricity, gas, towels and bed and kitchen linen. High quality villa full of charm, located in a quiet residential area just minutes from San Francisco and just minutes from the most beautiful sandy beaches (Illetes). 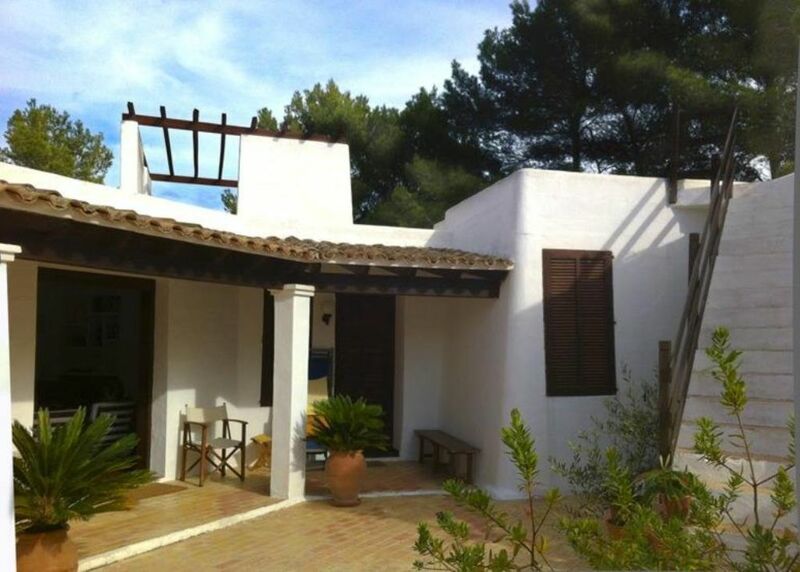 It has an amazing view of the sea and the salt pans of Ibiza. partially a function of the number of people .. Absolute quiet and equipped with all the services the house is set in a pristine landscape. "We rented the house with 2 families, 4 adults and 6 children.. it was perfect! It was given to us in a very need and clean condition, it had a nice and warm atmosphere and the location close to ST. Francesc is just perfect.. restaurants such as CanaPepa and Can Carlos just around the corner, but far enough from noise.. it is located in a residential neighborhood and has a nice view on the salt lake and the sea.. we had a great time thanks to Cristina (owner) she also gave some recommendations which were really helpfull (car rental.etc) someone even waited for us at the ferry and helped us finding the house.. what a service.. just a good place to go and that at a very reasonable price! Thakns a lot!" "Very nice and calm villa. Fantastic view from the roof terrasse to the sea and the half island. You can go by feet to the center of San Francesc in about 15 minutes, nice way. The equipment of the kitchen is in very good condition." "Che dire di questa casa... fantastica... posto meraviglioso, tranquillo, vista sul mare, verde intorno che ripara dalla calura. La situazione ideale per una vacanza con gli amici o in famiglia. La proprietaria, Cristina , è gentilissima e sempre disponibile. Siamo pronti per ritornarci al più presto"
"casa molto bella, in un contesto silenzioso e suggestivo che valorizza la vacanza sull''isola"
"una vacanza meravigliosa. Nulla mi è sembrato fuori posto. Consiglio a tutti questa villa che si distingue per una totale eccellenza. Sembra di essere in paradiso"
"Siamo stati molto bene , la villa è perfetta,pulita e molto confortevole.